Mulching strawberry plants is a necessary step in the care of perennial strawberry care. 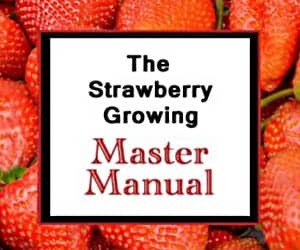 For gardeners using the matted row system to produce strawberries, part of the process of growing strawberries involves strawberry renovation and preparation for overwintering strawberry plants. In milder temperate climates, minimal mulching is required as strawberries can withstand nominal freezing temperatures without much difficulty. However, if temperatures drop below 10 degrees Fahrenheit, the crowns will often sustain damage and fail to bloom the following spring. One of the simplest and most common methods of protecting the strawberry crowns is to use a thick layer of straw mulch to cover and protect the vulnerable crowns during the cold of winter. It is relative easy to apply and serves several beneficial functions for your plants. As already mentioned, the primary benefit obtained by straw mulching your strawberry bed is the prevention of cold injury. However, simple temperature control is not the only benefit of using a straw mulch (or other mulch). Mulching appropriately also prevents frost heaving of the crowns. Additionally, the moisture content of the dormant plants is better maintained by preventing the winter winds from desiccating. And, perhaps most importantly, mulching helps reduce the risk of your plants developing black root rot. Black root rot is more common in plants that have developed susceptibility to it because of cold injury. 1. Obtain clean straw. Oat, rye, or wheat straw are the best mulching straw types because it isn’t heavy, is loose, and won’t smother the plants. Leaves will form a dense, smothering layer, and hay usually contains a host of weed and grass seeds that will germinate in warmer weather and will compete with or choke out your strawberries. Using straw also reduces the chance of inoculating your bed with insect pests or other pathogens. One bale of straw will typically cover about 30 feet of 4-foot-wide matted row. 2. Choose the appropriate time to apply the straw mulch. The straw should not be applied until the strawberry plants have gone dormant for the winter. Otherwise, the plants might be smothered. Strawberry plants typically go dormant when the temperatures have dropped into the mid-20° F range for 3-4 consecutive days. Plants can usually be identified as dormant by the older leaves, which will turn brown first. The younger leaves will turn from a bright green to a dull green or gray color. It is best not to wait until the ground is completely frozen. 3. Apply the straw mulch to the strawberry plants. Once the plants are dormant, apply the mulch! Break up the bale and then break the flakes completely. Apply loose straw to the row of strawberry plants 3 to 6 inches deep. It is also good to cover any exposed soil between rows or in the planting. 4. Remove the straw before springtime. It is important to remove the straw mulch from the plants prior to them beginning to grow. Gently rake most of the straw off the plants and into the rows as soon as the top 2-4 inches of soil have warmed to 4o degrees. Leave a thin layer of straw over the plants. The plants will grow up through this thin covering, and it will also serve to keep the strawberries clean and minimize contact with the dirt beneath. If cared for appropriately, strawberry plants will produce well year after year. In fact, with effective transplanting, your strawberries can keep replenishing themselves for a lifetime! So, mulch appropriately. 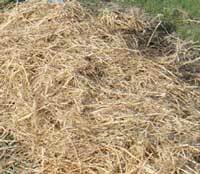 Straw is an excellent choice for mulching medium, although some people like to use newspaper. So, plant to give a little tender loving care to you strawberry bed, and your strawberry plants will reward you with numerous harvests to come! Good luck! since mulching my crowns have gone all black will they come back ? You say to mulch when the temp hits 20 degrees for 4-5 consecutive days. Are your referring to overnite temps or 24-hour temps? I just completed my 3rd year of strawberries; this year was a bumper crop! I plan to thin out the plants in the spring so they can be shared with a neighbor. (Good idea??) I also renovated in mid July, first time to have done so, and was amazed at the new growth!! Wow! Plot has been watered regularly until recently. A lot of discussion on physical protection. How about suggestions on pre winter nutrients/amendments. Because my strawberry bed suffers from vole damage (they eat my strawberries, too) I am thinking to use an old cast iron claw foot tub as a planter. My question is whether or not I could mulch that effectively enough for plants to survive a Vermont winter. If I fill it with dirt I certainly won’t be able to move it into shelter for winter. My daughter bought a new home with a large strawberry patch. The former owners did not trim the leaves, winter has passed and we are close to April. What should she do now? Is it OK to use Reemay instead of straw for overwintering strawberry plants in the ground (in coastal Connecticut, where Dec/Jan/Feb overnight lows are in the 20s most nights, I would estimate)? Or does it really need to be straw for over the winter, and then Reemay just for occasional late frosts in spring after the straw has been removed? Melissa, Reemay can restrict air flow and promote the growth of pathogenic fungus if it is applied directly and compresses organic material underneath. If you can ensure that compression doesn’t occur, it is ok to use Reemay. But, I’m partial to the straw :). Good luck!